In cardiac catheterization (often called cardiac cath), your doctor puts a very small, flexible, hollow tube (called a catheter) into a blood vessel in the groin, arm, or neck. Then he or she threads it through the blood vessel into the aorta and into the heart. Once the catheter is in place, several tests may be done. Your doctor can place the tip of the catheter into various parts of the heart to measure the pressures within the heart chambers or take blood samples to measure oxygen levels. 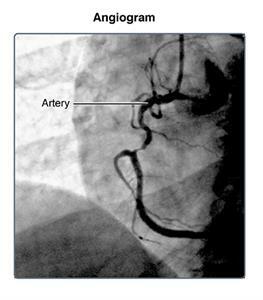 Your doctor can guide the catheter into the coronary arteries and inject contrast dye to check blood flow through them. 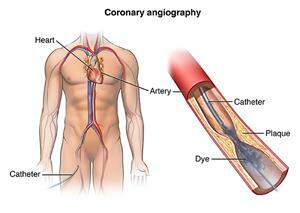 (The coronary arteries are the vessels that carry blood to the heart muscle.) This is called coronary angiography. Angioplasty. In this procedure, your doctor can inflate a tiny balloon at the tip of the catheter. This presses any plaque buildup against the artery wall and improves blood flow through the artery. Stent placement. In this procedure, your doctor expands a tiny metal mesh coil or tube at the end of the catheter inside an artery to keep it open. Intravascular ultrasound (IVUS). This test uses a computer and a transducer to send out ultrasonic sound waves to create images of the blood vessels. By using IVUS, the doctor can see and measure the inside of the blood vessels. A small sample of heart tissue (called a biopsy). Your doctor may take out a small tissue sample and examine it under the microscope for abnormalities. During the test, you will be awake, but a small amount of sedating medicine will be given before starting to help you be comfortable during the procedure. Why might I need cardiac catheterization? 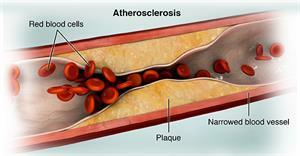 Atherosclerosis. This is a gradual clogging of the arteries by fatty materials and other substances in the blood stream. Congenital heart disease. Defects in one or more heart structures that occur during fetal development, such as a ventricular septal defect (hole in the wall between the two lower chambers of the heart) are called congenital heart defects. This may lead to abnormal blood flow within the heart. Heart failure. This condition, in which the heart muscle has become too weak to pump blood well, causes fluid buildup (congestion) in the blood vessels and lungs, and edema (swelling) in the feet, ankles, and other parts of the body. Heart valve disease. Malfunction of one or more of the heart valves that can affect blood flow within the heart. If a screening exam, such as an electrocardiogram (ECG) or stress test suggests there may be a heart condition that needs to be explored further, your doctor may order a cardiac cath. There may be other reasons for your doctor to recommend a cardiac cath. What are the risks of cardiac catheterization? If you are pregnant or think you could be, tell your doctor due to risk of injury to the fetus from a cardiac cath. Radiation exposure during pregnancy may lead to birth defects. Also be sure to tell your doctor if you are lactating, or breastfeeding. There is a risk for allergic reaction to the dye used during the cardiac cath. If you are allergic to or sensitive to medicines, contrast dye, iodine, or latex, tell your doctor. Also, tell your doctor if you have kidney failure or other kidney problems. For some people, having to lie still on the cardiac cath table for the length of the procedure may cause some discomfort or pain. How do I prepare for cardiac catheterization? Your doctor will explain the procedure to you and give you a chance to ask any questions. Tell your doctor if you have ever had a reaction to any contrast dye; if you are allergic to iodine; or if you are sensitive to or are allergic to any medicines, latex, tape, and anesthetic agents (local and general). You will need to fast (not eat or drink) for a certain period before the procedure. Your doctor will tell you how long to fast, usually overnight. If you are pregnant or think you could be, tell your doctor. Tell your doctor if you have any body piercings on your chest or abdomen (belly). Tell your doctor of all medicines (prescription and over-the-counter), vitamins, herbs, and supplements that you are taking. You may be asked to stop certain medicines before the procedure. Your doctor will give you detailed instructions. Let your doctor know if you have a history of bleeding disorders or if you are taking any anticoagulant (blood-thinning) medicines, aspirin, or other medicines that affect blood clotting. You may need to stop some of these medicines before the procedure. Let you doctor know if you have any kidney problems. The contrast dye used during the cardiac cath can cause kidney damage in people who have poor kidney function. In some cases, blood tests may be done before and after the test to be sure that your kidneys are working properly. Your doctor may request a blood test before the procedure to see how long it takes your blood to clot. Other blood tests may be done as well. Tell your doctor if you have heart valve disease. Tell your doctor if you have a pacemaker or any other implanted cardiac devices. You may get a sedative before the procedure to help you relax. If a sedative is used, you will need someone to drive you home afterward. Based on your medical condition, your doctor may request other specific preparations. What happens during a cardiac catheterization? A cardiac cath can be done on an outpatient basis or as part of your stay in a hospital. Procedures may vary depending on your condition and your doctor's practices. You'll remove any jewelry or other objects that may interfere with the procedure. You may wear your dentures or hearing aids if you use either of these. Before the procedure, you should empty your bladder then change into a hospital gown. A healthcare professional may shave the area where the catheter will be put in. The catheter is most often put in at the groin area, but other places used are the wrist, inside the elbow, or the neck. A healthcare professional will start an intravenous (IV) line in your hand or arm before the procedure to inject the dye and to give you IV fluids, if needed. You will be connected to an ECG monitor that records the electrical activity of your heart and monitors your heart during the procedure using small electrodes that stick to your skin. Your vital signs (heart rate, blood pressure, breathing rate, and oxygen level) will be monitored during the procedure. Several monitor screens in the room will show your vital signs, the images of the catheter being moved through your body into your heart, and the structures of your heart as the dye is injected. You will get a sedative in your IV before the procedure to help you relax. But you will likely be awake during the procedure. Your pulses below the catheter insertion site will be checked and marked so that the circulation to the limb can be checked after the procedure. Your doctor will inject a local anesthetic (numbing medicine) into the skin where the catheter will be put in. You may feel some stinging at the site for a few seconds after the local anesthetic is injected. Once the local anesthetic has taken effect, your doctor inserts a sheath, or introducer into the blood vessel. This is a plastic tube through which the catheter is thread into the blood vessel and advanced into the heart. If the arm is used, your doctor may make a small incision (cut) to expose the blood vessel and put in the sheath. Your doctor will advance the catheter through the aorta to the left side of the heart. He or she may ask you to hold your breath, cough, or move your head a bit to get clear views and advance the catheter. You may be able to watch this process on a computer screen. Once the catheter is in place, your doctor will inject contrast dye to visualize the heart and the coronary arteries. You may feel some effects when the contrast dye is injected into the catheter. These effects may include a flushing sensation, a salty or metallic taste in the mouth, nausea, or a brief headache. These effects usually last for only a few moments. Tell the doctor if you feel any breathing difficulties, sweating, numbness, nausea or vomiting, chills, itching, or heart palpitations. After the contrast dye is injected, a series of rapid X-ray images of the heart and coronary arteries will be made. You may be asked to take a deep breath and hold it for a few seconds during this time. It’s important to be very still as the X-rays are taken. Once the procedure is done, your doctor will remove the catheter and close the insertion site. He or she may close it using either collagen to seal the opening in the artery, sutures, a clip to bind the artery together, or by holding pressure over the area to keep the blood vessel from bleeding. Your doctor will decide which method is best for you. If a closure device is used, a sterile dressing will be out over the site. If manual pressure is used, the doctor (or an assistant) will hold pressure on the site so that a clot will form. Once the bleeding has stopped, a very tight bandage will be placed on the site. The staff will help you slide from the table onto a stretcher so that you can be taken to the recovery area. NOTE: If the catheter was placed in your groin, you will not be allowed to bend your leg for several hours. If the insertion site was in your arm, your arm will be elevated on pillows and kept straight by placing it in an arm guard (a plastic arm board designed to immobilize the elbow joint). In addition, a tight plastic band may be put around your arm near the insertion site. The band will be loosened over time and removed before you go home. What happens after cardiac catheterization? After the cardiac cath, you may be taken to a recovery room or returned to your hospital room. You will stay flat in bed for several hours. A nurse will monitor your vital signs, the insertion site, and circulation/sensation in the affected leg or arm. Let your nurse know right away if you feel any chest pain or tightness, or any other pain, as well as any feelings of warmth, bleeding, or pain at the insertion site. Bedrest may vary from 4 to 12 hours. If your doctor placed a closure device, your bedrest may be shorter. In some cases, the sheath or introducer may be left in the insertion site. If so, you will be on bedrest until your doctor removes the sheath. After the sheath is removed, you may be given a light meal. You may feel the urge to urinate often because of the effects of the contrast dye and increased fluids. You will need to use a bedpan or urinal while on bedrest so you don't bend the affected leg or arm. After the period of bed rest, you may get out of bed. The nurse will help you the first time you get up, and may check your blood pressure while you are lying in bed, sitting, and standing. You should move slowly when getting up from the bed to avoid any dizziness from the long period of bedrest. You may be given pain medicine for pain or discomfort related to the insertion site or having to lie flat and still for a prolonged period. Drink plenty of water and other fluids to help flush the contrast dye from your body. You may go back to your usual diet after the procedure, unless your doctor tells you otherwise. After the recovery period, you may be discharged home unless your doctor decides otherwise. In many cases, you may spend the night in the hospital for careful observation. If the cardiac cath was done on an outpatient basis and a sedative was used, you must have another person drive you home. Once at home, you should check the insertion site for bleeding, unusual pain, swelling, and abnormal discoloration or temperature change. A small bruise is normal. If you notice a constant or large amount of blood at the site that cannot be contained with a small dressing, contact your doctor. If your doctor used a closure device at your insertion site, you will be given instructions on how to take care of the site. There may be a small knot, or lump, under the skin at the site. This is normal. The knot should go away over a few weeks. It will be important to keep the insertion site clean and dry. Your doctor will give you specific bathing instructions. Your doctor may advise you not to participate in any strenuous activities for a few days after the procedure. He or she will tell you when it's OK to return to work and resume normal activities. Your doctor may give you other instructions after the procedure, depending on your particular situation.